Having a good web hosting service is essential if a business wants to retain and enhance their online presences. It is this sort of presence that would breed familiarity of their brand as well as lead to active selling. Web hosting services may be widespread, but they need a lot of features to make them really stand out. For instance, they need an excellent method of customer service, a certain amount of flexibility, and several package deals to choose from. 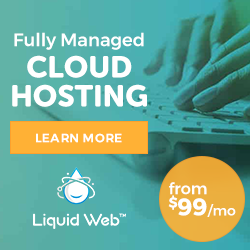 Liquid Web isn’t your everyday, run-of-the-mill web hosting service. It actually caters to a large number of really well-known and highly reputed brand names. This web service is actually so string that it powers giants like Porsche, National Geographic, and Home Depot. Liquid Web has server packages for WordPress, cloud services, and highly dedicated servers to complete their tasks with. It is the preferred choice for many large companies when it comes to managed web hosting. This is an advantage for any company who’s looking for a reliable web hosting service. When you know a certain facility is good enough for such huge brand, it’s good enough for just about any business. Plus having your brand name linked to famous brand names would automatically up its reputation and hence its sales as well. Liquid Web provides a powerful foundation on which any company can build their website with trust and surety. The servers they provide come in several different configurations according to a company’s needs. You could opt for a basic server that has one processor, 16GB RAM or go for a more high-end option with 32GB RAM. Liquid Web’s Hosting would provide its customers with a lot of security features. These include VPNs, firewalls, scanners for malware and spyware, removal of viruses, etc. There are also backups performed every night, which could potentially save a lot of data in worst case scenarios. Finding a site down is more than enough to turn many customers away from your business. With Liquid Web, companies can be sure of having their websites up and running most of the time. The customer service with Liquid Web is greatly enhanced with a team of informed and knowledgeable individuals. These people have no hesitation in assisting anyone who reaches out to them for help or to register a complaint. They offer contact through chat, phone, and several other mediums. As mentioned above, not every humble-startup can make use of Liquid Web’s excellent web hosting services. Since the service is at such a high level, one has to be prepared to pay the price. The cost of Liquid Web’s hosting packages may not be so much for large corporations. However, individuals starting their own business, new start-ups, and struggling local businesses are usually not able to shell out such a large amount right away. The high expense of Liquid Web means that small businesses wouldn’t have any room for expansion trough this means. This is quite a pity, since more and more customers are now looking towards local businesses in order to purchase responsibly. Expensive web hosting services hence only encourage the cold corporate culture instead of fostering a welcoming environment for smaller competitors. Compared to other web hosting services, Liquid Web is hence one of the most expensive options to go for. The prices difference can be huge, with basic severs offered at less than five dollars each. One of the reasons why Liquid Web Hosting is so expensive is that it doesn’t allow for shared hosting services. Along with other advantages, this option would have made this particular service quite a bit cheaper. There are several other reliable web hosting services online which have more affordable packages along with shared hosting options. 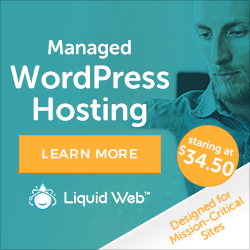 With Liquid Web, one gets WordPress web hosting at no less than three tiers. This would start at $119 on a monthly basis. The client company would get a whopping five terabytes of data transfers along with a hundred gigabytes of solid-state drive. They would also have ten domains to host their site on. Option to create your own theme or apply one you purchased from another place. Liquid Web’s cloud hosting is nothing to sneeze at. This kind of hosting is getting more and more necessary in these modern times, since it means that the site’s resources are spread across many different servers. What this means is that no one server is overloaded with work. Again, there are several tiers to cloud hosting when it comes to Liquid Web. You can choose from Private loud, Public Cloud, and Dedicated Cloud. There is also the option of using this web hosting service on a Windows or Linux operating systems. One can start off with a basic and cheaper server and upgrade to a new one as they expand their business operations. There a lot to be said for a strong website and Liquid Web’s dedicated servers are among the best choices. There are several configurations to choose from here, so a company can pick and choose according to their needs and budget. A startup, providing it has the finances to do so, can begin with the basic package. This consists of a single-processor server that contains sixteen GB of RAM. This starts at $199 a month. If the company gets more established, they can upgrade to higher configurations. The maximum here is a dual-core processor with 32GB RAM. This is a high-end option and its cost starts with $599 a month. Dedicated servers could cost quite a bundle. Hence, a company can also opt for simple VPS Web Hosting by Liquid Web. 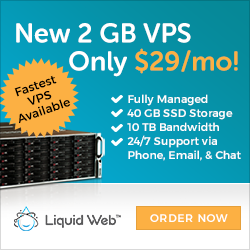 One of the unique offers by Liquid Web with regards to this product is that it charges only for the days that the servers are actually used. This cuts down on costs and also makes cancellation simple. The most basic VPS plan begins at $59 a month and gets you 2GB RAM, 5TB data transfers, 40GB solid-state storage, and email without limits. The most high-end offer begins at $219 a month. This can give a company 1.6TV storage, 256GB RAM, and a choice between Linux and Windows servers. One can also opt for customizing their own server. A company may offer web hosting themselves, but still opt for Liquid Web as a way to get the benefit of their great products. Plus, hosting with Liquid Web means no messing around with servers, handling bandwidth issues, and any matters relating to infrastructure. There are hence several reseller packages especially constructed for companies like this. The plans for reseller packages usually cost $59 a month and upwards. This comes with an exclusive plug-in called the WebHost Manager Complete Solution. It also has instant provisioning. Both dedicated and VPS packages of the reseller variety are available in Linux and Windows formats. These paces are equipped with the same amount of RAM, data transfers limit, storage, etc, that are in the regular packages. However, there are no shared packages of the reseller kind either. 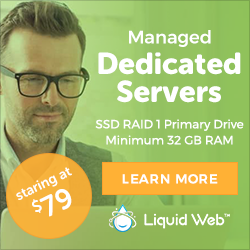 When one gets a reseller package from Liquid Web, they have permission to apply whatever branding they choose for the rented servers. In addition to this, there’s also tech support provided around the clock. With all the services outlined above, it’s no surprise that Liquid Web is one of the most trusted web hosting services available today. There are several reasons for this, but not everything is perfect, especially when it comes to online services. While this company has a variety of VPS (Virtual Private Servers) and flexible packages, not every company can make use of them. Those who can afford Liquid Web servers, however, should definitely go for it. There is a huge variety of services on offer, and the packages are generous and up-to-date. Investing in such a service could greatly sharpen the website performance of many companies.